The rehearsals for our summer theatre spectacular are in full swing now with only one week to go to the first performance. All the action takes place in various spots around our courtyard, in front of the barn and the house. There will be music and lighting to accompany the drama which won’t begin until after sundown. Some of the best scenes play out against the backdrop of our little ‘Juliet balcony’ at the top of a flight of time-worn stone steps that lead to the upper storey of the barn. The room is now a large sitting room but at one time was a hay loft for the animals which lived in what were the stables below. As I was wondering what I could shoot for my Thursday doors contribution this week, it suddenly seemed an obvious choice. Thanks as always to Norm for hosting the challenge. Thats beautiful Jane and the perfect setting for some Shakespearian theatre! Thank you Ian! It is a perfect setting for outdoor theatre, the adaptation of this piece was made with just this setting mind! Thank you very much Ian, that’s very kind of you, we cross our fingers! Wonderful photos! Love old doors, stairs and balconies. What bliss! I want to be there. One of my favourite jobs was doing an open-air production of The Country Wife. Thank you Janet! It is rather a pretty corner – it’s the site of a couple of very dramatic scenes in this production! 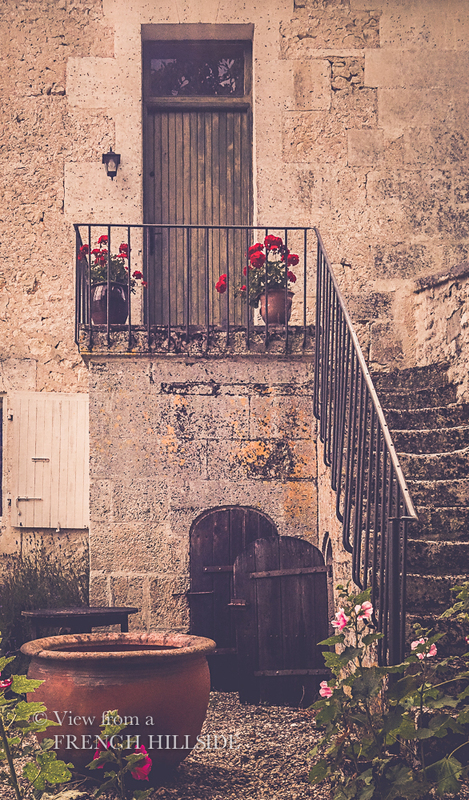 Lovely steps and door, most gently atmospheric…. We’re in Charente – Bordeaux and right a bit! Not far from Cognac and Angoulême. Yes it remains a highlight of the calendar here along with the festival of ‘la bande dessinée’ (cartoons, comic books) at the start of each year! My second thought was the Vienne…I think that’s closer! Thank you so much Douglas – really appreciate it! So welcome Jane. You are a most gifted photographer and artist! You’re very kind and I really appreciate that you think so Douglas, you make my day! Ooh, the dark wooden doors beneath the stairs also call to me. If I were a kid I’d be in pig heaven exploring all around your property. Okay, who am I kidding, I’d be that way to this day. There is such adventure all around. Can’t wait to hear all about the production and performances, Jane. Fingers crossed you get your small scene and steal the show. Thanks Shelley! You wouldn’t believe the last few days, I shall be obliged to write about it in one form or another! Photos and more news to follow shortly – only 5 days to go now!! Quite so Kaz! They really do carry some history within! They are always welcoming, no matter how good or bad the times are.